Rising from dire poverty, Alvis Edgar "Buck" Owens would go on to change the face of modern country music. The son of a Texas Sharecropper, Buck was born in Sherman, Texas. In 1937 10 members of the Owens family including Buck packed up and began a "Grapes Of Wrath" migration west to California. Along the way their trailer hitch broke near Phoenix, Arizona. With family in nearby Mesa, Arizona the Owens family relocated in the desert for over 10 years. Young Buck would join his family in back breaking farm labor picking cotton, oranges and other crops all over Arizona and up into California. He held other jobs as a truck driver, newspaper and Western Union delivery boy. The poverty in his life did not appeal to him and at a young age he began teaching himself how to play several instruments including guitar, mandolin and trumpet. He began frequenting the various local dance halls and taverns that played music. He joined a band called Mac's Skillet Lickers and would eventually go on to have a short 15 minute radio show called "The Buck and Britt" show with another musician over Mesa radio station KTYL. Married to Bonnie Campbell by the late 40's Buck would move to Bakersfield, California in 1951 on the advice of a relative who had seen the blossoming country music scene in the California city that included a large population of "Oakies" and "Texans" fleeing the dust bowl days of the depression. In due time Buck began playing the various local dancehalls honing his skills as a guitar player. He would play lead guitar on a session for singer Tommy Collins at Capitol records in Hollywood in 1953 that would garner him more exposure for his talents. Buck signed on to play a club called the BLACKBOARD 6 nights a week and packed in the crowds every night. He would continue to supplement his income with recording sessions at Capitol for many other singers of the day. By the late 50's there was interest from Columbia records and others to sign him to a contract but in 1957 Ken Nelson of Capitol records would recognize his talents and finally offer him a recording deal. His first singles bombed. For a short few years Buck moved to Tacoma, Washington to become part owner of a small radio station and play music gigs. It was on a small local tv show that Buck would fortunately meet a fiddle and later guitar player that would be instrumental in the future success of Buck Owens. His name was Don Rich. Buck would develop his own twisted note style and expand on the Bakersfield sound of sparse electric guitar, upfront drums and percussion that had a little bit more "kick" in the music than conservative Nashville and its brand of country music. By the late 50's Buck had scored a couple of chart hits and feeling momentum in the music business moved back to Bakersfield and continued to record for Capitol. Don Rich would soon join him and they began touring up and down the west coast. Several top 10 records would soon lead to his first number one Billboard hit "Act Naturally" in 1963. The many years of honing his musical skills in Bakersfield would continue to pay off where Buck would have some 15 number one records from 1963 to 1967. Buck played Carnegie Hall in New York City in 1966, only the second country act to ever play and record a live album there. Not only was Buck becoming a huge country star in America, but would win fans over seas in Japan, Germany, Switzerland and England. In 1969 television producers approached Buck about starring in a comedy variety show. That show became HEE HAW. It had a short run on CBS television before going into syndication and lasted some 24 years on the air. Buck was part of the cast from 1969 until 1986. Over the years Buck would continue to diversify and owned several successful country radio stations including KNIX, Phoenix and KUZZ, Bakersfield. He owned a publishing company, recording studio, his own booking agency, print publications and land. A striking personal blow came when Buckaroo lead guitarist Don Rich was killed in a motorcycle accident in 1974. Buck took Don's death pretty hard and would soon semi-retire from music and run his business empire. In 1987 a young singer named Dwight Yoakam would take a bold step and visit Buck unannounced late one day inviting Owens to play on stage with Yoakam that night at the Kern County Fair. 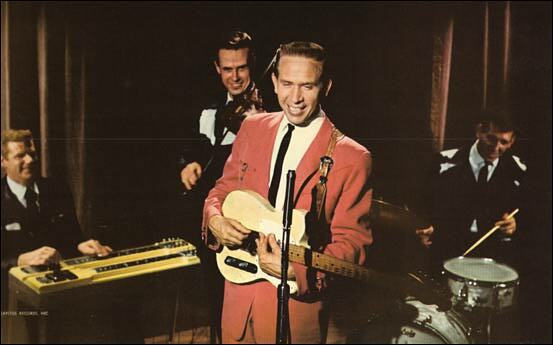 A friendship soon blossomed and Yoakam recorded the Homer Joy song "STREETS OF BAKERSFIELD" and invited Buck Owens to perform on the recording with him. This song would go on to become Dwight Yoakam's first number one single and Buck Owens 21st number one hit. Buck came out of retirement to play and record for 2 to 3 more years and had another brief time in the sun. In 1996 Buck opened his soon to be popular CRYSTAL PALACE nightclub, restaurant and museum in Bakersfield. He was finally inducted into the Country Music Hall Of Fame that year and would play with his Buckaroo's band every Friday and Saturday night for the last 10 years of his life. He influenced hundreds of people in country music and country radio. He was a beloved entertainer to millions of fans worldwide and helped launch and revolutionize country music with the unique Bakersfield Sound. 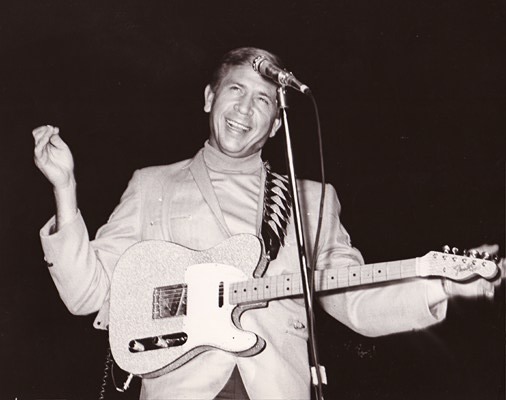 Buck Owens died of heart failure in his sleep on March 25th, 2006 at his ranch north of Bakersfield, California. For an in-depth introduction to Buck Owens you can't do any better than Rhino's 1992 three CD box-set which is still available from pretty much any shop on the internet. Covering over thirty years the set runs to 62 tracks and features an informative booklet. It covers virtually all of his hits and is a brilliant insight into the Bakersfield sound that Buck took to the masses. The Corky Jones era is missing from the beginning but that's about the only negative thing I can think of. Kicking of with his debut hit from 1959, Second Fiddle, the Capitol hits all the way through to the mid 70's ooze class. From the Warner period of the late �70s we get his duet with Emmylou Harris, Play Together Again, Again. The set rounds of with the hit singles with Ringo and Dwight. More than anything else, the compilation shows how enormously talented Buck and Don Rich were together. They were as tight as brothers and this showed in both their sound and their stage interaction. This is the genuine article and is the best place to start your Buck Owens collection. Essential. This early, pre-Capitol release is the perfect companion to the Rhino collection above. It's always fascinating to hear an artist retrospectively as they search for the sound that will later make them their mark. This is pure country music from the Pep, Chesterfield and La Brea labels. For the rockabillies there's the crazy stomp of Hot Dog and Rhythm and Booze when Buck used the pseudonym Corky Jones. Recommended. The Sundazed label has done a great job bringing Buck's back catalogue into the CD era. When Buck Owens & the Buckaroos played this concert at Carnegie Hall in 1966 they were making a statement that country music had finally spread from the hillbilly joints of the rural south to the rest of America. The sound is first-rate with the Buckaroos smoking on a night when they must have been so up for it. They play with a skill and intensity that still comes through the grooves, some 40 years later. Essential. Don Rich was more than just a Buckaroo. He was Buck's soul-mate and when Don died I'm not surprised that Buck went into such a state of disillusionment of music. Rich and the Buckaroos recorded a few instrumentals and at various sessions Buck let him record a number a two. Country Pickin' collects together 24 of these songs and the results are a solid set of Bakersfield country. Perhaps not laced with the classics of Buck, the whole thing still oozes class and is still better than a good number of stars could do. The booklet is splendid with a biography, rare photos and tributes from Buck, Dwight Yoakam, Merle Haggard and Marty Stuart among others. Worth checking out. A quick search in youtube reveals loads of Buck Owens clips and tributes, here are just a few. Buck Owens - Loves Gonna Live Here. From the Jimmy Dean Show. Sharp haircuts, clothes and sound and picture quality from '66. Buck and Don Rich in a fine early clip. Great colour clip from 67 with Buck and Don in matching Davy Crockett jackets. From the 1964 movie "Country Music On Broadway". Hee-Haw hoedown with the likes of Grandpa Jones. Dwight Yoakam & Buck Owens. 7 minute clip from the Country Music Hall Of Fame Awards 1996. Dwight Yoakam Interviewed At Buck Owens Birthday Bash 2007. ABC23's Nick Belardes films an interview with Dwight Yoakam who talks about performing at the Crystal Palace, and about "Dwight Sings Buck". Interview undertaken at Buck Owens Crystal Palace. Dwight Sings Buck EPK. Dwight Yoakam talks about his new album Dwight Sings Buck and his relationship with friend and mentor. Dwight Yoakam & Buck Owens' Streets Of Bakersfield. Dwight Yoakam sings In The Garden at Buck Owens funeral service. An emotional, heartfelt and truly touching tribute from DY. Fascinating 8 minute clip as Buck and Merle reminisce. Friends and family bid farewell - includes a haunting latter day appearance from the Crystal Palace. DY, Billy Gibbons, Brad Paisley, Chris Hilman and Buckaroo Tom Brumley Tribute to Buck at the 2006 ACM awards. Hosted by Vince Vaughan. This is what I wrote in March 2006 in recognition of Buck. As a tribute to Bakersfield country music legend Buck Owens (or Corky Jones for any rockabillies), I'd like to just pick a top 10 of my favourites. I know Bob Timmers got to become friends with Buck recently, and he sure sounded like a real nice bloke (Buck that is!). Listening to the songs below, you remember that his Buckersfield sound was as unique to him as the boom-chicka-boom was to Johnny Cash. Buck's first chart hit from the summer of 1959 was a stone cold country song full of steel and fiddle. He gives perhaps his best ever vocal performance. Whilst the country radio stations battled to keep the rockabilly dogs at bay, songs like this must have kept the kinfolk on the homestead happy. "I've got the hungries for your love, and I'm waitin' in your welfare line". I love the version from the Live at Carnegie Hall album where Don Rich takes a short but oh so tasty solo. Oh the innocence of those days - Buck asks her "Give me a hand-out". I'm sure today he'd be asking "give me a hand-job". Not surprising, this went all the way to the top in 1966. A pure country backing to a hard boiled lyric suggesting the only way to keep his misses at home is to close up the honky tonks - what a tart. If this couldn't fill a salted dance floor, then Dwight Yoakam doesn't paint his trousers on. How this never made it onto the top side of a 45 is beyond me, it says volumes for the quality of stuff he was releasing at this time. Durting the mid-50s there was a plethera of frustrated honky tonkers turning their hand to the emerging rockabilly sounds. Buck was a great example, tackling the genre with all the exhuberance of a Memphis teenager. Hot Dog oozes teenage pleasures, flashy guitar licks and hot-potato-in-the-mouth vocals, and is one of the greats. Corky the Cat, you was one fine feline! Catchy and melodic, it must have surprised no-one when Capitol released this surefire hit in the summer of 1964. Don Rich finds a nice groove again and the heavy acoustic guitar underpins Buck's vocals to a tee. This snappy mover went to number three in the country charts in the spring of 1960 and confirmed that Buck was going to be a Hall of Famer, following as it did the top Fiver, Under Your Spell Again. Available on the Young Buck CD (Country Music Hall of Fame - Classics Collection), Country Girl sees Buck in Hank Williams mode. He hadn't yet found his sound but it good fun listenming to him try. It's an energic steel driven number with unrelenting loping guitar. Buck and Rich do an Everly Brothers on this catchy number one single. Rich's guitar again plays a solid part in the songs appeal. Can't say I'm the world's greatest lover of country instrumentals, I always think the steel or fiddle should just add about thirty seconds of respite whilst the singer tries to regain his composure following a couple of verses of anguish and pitiful heartache. Buckaroo is a fine exception, with Don Rich's guitar finding a glorious groove that shot the song to the top slot in November 1965. Buck's Polka is no slouch either, but I wouldn't put two instrumentals in a top 10, unless it was a Duane Eddy list I suppose. From the Ray Price school of country, this would have warmed the cockles of many a honky tonk lover during the bleak winter of 1961. Buck is on top form, but the fiddle player steals the show, helping push the song just one short of the top spot.